After two weeks training at Etaples Base Camp, soldiers were sent to the Western Front. This usually involved a journey of about 60 miles. This was usually a combination of a train journey and several hours of marching. This became known as going 'Up the Line'. The men complained bitterly about the way they were transported to the front-line. As Private W. T. Colyer commented: "We were not expecting to travel first or even second class on the train, but we thought we might have a reasonable chance of 3rd. It turned out we were to go about 7th class; i.e. in plain cattle-trucks with a little straw on the floor of them." Another remarked that the experience convinced him that the: "Army have no consideration for the men at all". 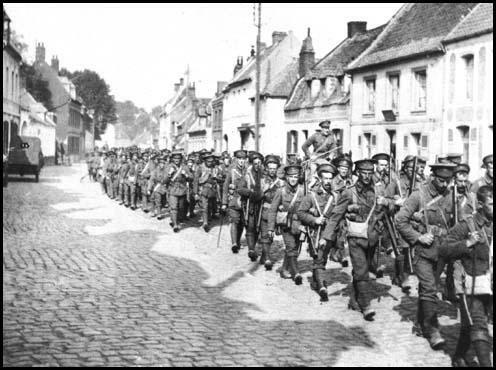 British soldiers marching to the front-line in France. 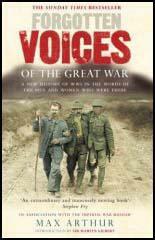 Once they got to the front-line the men suffered from nerves. Harry Patch later recalled: "You talked to your mates in the team. There was always a certain amount of chatter. Nerves, you might call it. I used to think, shall we get through tomorrow, or shall we get a packet? Am I going up the line tonight, will I be coming back? It's dark and everything may be quiet now, but am I going to see the sun come up in the morning? And when the sun comes up in the morning, shall I see it set at night? At some point you showed your emotions. That was why our comradeship was so important, because I was scared more or less all the time I was out there." The journey to the front-line was full of hazards. As Guy Chapman pointed out: "We tore ourselves singly from the mud and bundled on to the road, diving towards a dark opening in the other bank. The machine gun threw a few desultory shots past us. The bullets cracked sharply overhead. We tumbled into another trench and went on. This one was narrow, too, but shallower and duck-boarded. We moved more quickly. We could see lights raising and falling in front of us, and the noises interpreted themselves as rifles and machine guns firing." Up at 5.30 to depart for Front at 6.30. Breakfast supposed to be at 5.30 but had a job to get it and when we did, only jam. Paraded at 6.30 and marched to sidings. (2) Private W. T. Colyer, Artists' Rifles, interviewed after the war. We were not expecting to travel first or even second class on the train, but we thought we might have a reasonable chance of 3rd. It turned out we were to go about 7th class; i.e. in plain cattle-trucks with a little straw on the floor of them. One of the largest trains I ever saw: 38 coaches of all sizes and shapes: we had two smashes on the way up: couplings pulled out, with a fearful jerk and consequent delays of half an hour, whilst we all got out to stretch our legs and the men made fires and cooked food in their billy cans. (4) Lance Sergeant Elmer Cotton, 5th Northumberland Fusiliers, arrived at the front-line at Ypres in July 1915. By the time we arrived at the outskirts of Ypres the traffic of ammunition and ambulance wagons and ceased and we were alone on the road. Suddenly we came across the corpse lying across the pavement - it was the body of a peasant. Just over the canal bridge a timber wagon and two shattered horses came into view and we walked through the blood of these noble animals as we passed them on the road. we were now in the town proper - everywhere nothing but ruins could be seen - not a house but was either shattered by shells or gutted with fire. On the way we passed more dead horses, which in many cases were in a state of decomposition and emitted a fearful odour of rottenness. The communication trench was just wide enough to accommodate a man with a full-pack, and about seven feet deep, so that one's vision was limited to a patch of darkening sky and the shoulders of the man in front. Its floor was covered with a foot of tensely glutinous mud. We drove slowly through the morass, wrenching out each foot before putting it down again. Darkness fell. After what seemed half a night, the guide stopped and said: "There's a road here. See and hurry over it. There's a machine gun on it. See? One at a time." We tore ourselves singly from the mud and bundled on to the road, diving towards a dark opening in the other bank. The machine gun threw a few desultory shots past us. The bullets cracked sharply overhead. We tumbled into another trench and went on. This one was narrow, too, but shallower and duck-boarded. We moved more quickly. We could see lights raising and falling in front of us, and the noises interpreted themselves as rifles and machine guns firing. Suddenly someone said: "Hullo," and Smith, my company commander, loomed up. "Is this the front line? I asked. "That's it." You talked to your mates in the team. There was always a certain amount of chatter. Nerves, you might call it. I used to think, shall we get through tomorrow, or shall we get a packet? Am I going up the line tonight, will I be coming back? It's dark and everything may be quiet now, but am I going to see the sun come up in the morning? And when the sun comes up in the morning, shall I see it set at night? At some point you showed your emotions. That was why our comradeship was so important, because I was scared more or less all the time I was out there. We were part of the battalion, but at the same time we were a little crowd on our own. You could talk to your pals about anything and everything. I mean, these boys were with you night and day, you shared everything with them. We each knew where the others came from, what their lives had been and where they were. You were one of them - we belonged to each other. It's a difficult thing to describe, the comradeship between us. I never met any of their people or any of their parents, but I knew all about them, and they knew all about me and mine. There was nothing that cropped up, doesn't matter what it was, that you couldn't discuss with them in one way or another. If you scrounged anything, you always shared it with them. You could confide everything to them. They would understand. Letters from home, when we got them, if there was any trouble in them, they would discuss it with you.